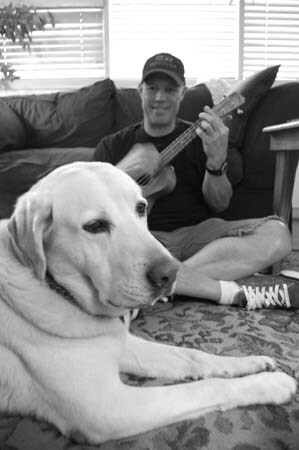 For many dog-years before he became a star on YouTube, Chester has been hanging out and making music with his surfing buddy Mike. "Me and Violet take care of the place when Mike goes away during the day," says Chester, introducing his older sis. "Except when the surf's up. That's when Mike and me hit the beach." A native of Harrisburg, where he worked in the orchard business, Chester relocated to Eugene at the age of eight weeks, when he signed a long-term contract with Mike and family. Even though his own favorite sport is fetch, he looks forward to frequent forays to the coast with Mike in their eternal quest for the Perfect Wave. Sometimes he paddles out into the surf, but mostly he keeps watch from the van, one paw on the 911 autodial button, while Mike ventures out on his board. "I used to watch from a towel on the beach," he explains. "Then one day a beach-patrol lady came along. She thought I would get a better view from the van." Chester admits that his musical inspiration comes from his namesake, Chester C. Burnett, better known as Howlin' Wolf. Check out the resemblance in Tonight You Belong to Me (cover) by Mike n Chester at youtube.com/watch?v=AkZ9SyEchZo.